In a rare show of unity in the Middle East, an advanced research centre to be shared by the troubled region has opened in Jordan. Sesame's vast white building, located amid dusty hills some 35km north of the capital Amman, makes a stark contrast to the olive groves around it. The idea of a Middle Eastern synchrotron was first mooted 20 years ago but the sheer novelty of the plan and the extreme sensitivities of the region led to endless delays in finance, design and construction. Now, standing in the centre of the completed - and tested - main ring of the Sesame synchrotron, Prof Llewellyn Smith admitted that he was "a bit surprised" that the venture had got so far. "The real problem has been finding the money - the countries in this region have science budgets that you can hardly see with a microscope," he said. "And there've been many times in the history of this project when a rational person would say 'let's give up' but it's so important it's kept going and here we are today." The turning point came in 2012 when Iran, Israel, Jordan and Turkey each agreed to contribute US$5m provided that all the others did too, though the Iranians have yet to pay. That unlocked further finance from Italy and also from the EU which funded Cern, the international particle collider in Geneva, to manufacture the magnets that guide Sesame's beams. Unesco has also provided support. 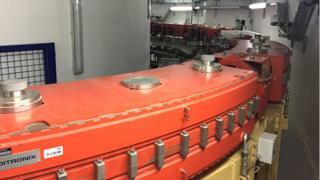 There are some 60 synchrotrons in use around the world but Sesame will be the first in the Middle East. The aim is to provide young scientists in the region with a reason not to emigrate to Europe or America - to try to help stem the brain drain of research talent. Dr Gihan Kamel is an Egyptian who returned to the Middle East from a synchrotron in Italy in order to work at Sesame. She sees the facility as vital for establishing advanced science in the region enabling it to develop techniques for the early detection of cancer or for analysing key crops to improve agriculture or explore treasured documents like the Dead Sea Scrolls which are 2,000 years old. She says that it takes time to adjust to working with people from different religions and cultures but that the result of collaboration makes it worth it. "We are not building a paradise, it's not an ideal place," she told me. "But we are creating something, we are giving hope for other people for other generations." One of the earliest movers behind the project, Prof Eliezer Rabinovici, a leading Israeli physicist, described the opening as "a very moving moment". "People and scientists from all over the region as well as many parts of the world have demonstrated that one can work together over decades for a common goal benefitting humanity," said Prof Rabinovici. "Today a tiny lighthouse is opened which can suggest another direction to the young generation." This comes amid escalating tensions in the region with the war in Syria right next door to the nation hosting Sesame, Jordan. Last month the King Abdullah of Jordan, who performed today's opening ceremony at Sesame, recently criticised Iran over its role in the Syrian conflict. So I asked a senior Iranian scientist, Prof Mahmoud Tabrizchi, whether these tumultuous events make a collaborative project like Sesame too difficult. "Science is different from politics," he said, describing Sesame as "the greatest event in science in the Middle East". "Scientists are doing their job. Science is like water - it flows between the countries but it never runs out. So it is better to share with each other." The opening ceremony was attended by royalty, ministers or senior officials from the Jordanian, Cypriot, Egyptian, Iranian, Israeli, Pakistani, Palestinian and Turkish delegations, and by the European Commissioner for research and science and the heads of Cern, Unesco and the International Atomic Energy Agency (IAEA). The first research using the synchrotron is due to start shortly with a "beam-line" using infra-red light with others to follow. And because of the high cost of electricity in Jordan there are plans for a solar farm which would make Sesame the first synchrotron to be powered by renewable energy. Looking ahead, already discussions have started about copying the Sesame model by building similar synchrotrons in other parts of the world including Africa and Central America.